"Our country's birthday on the Fourth of July is traditionally celebrated with parades, American flags waving in the breeze, fireworks exploding in summery skies, and picnics under cool shade trees. 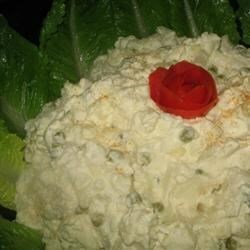 Of course, the picnic has almost always included potato salad, often this creamy old-time version." Bring a large pot of salted water to a boil, add the potatoes and let cook until tender. While the potatoes cook, in a large bowl, whisk together the vinegar, sugar, mustard, salt and pepper. Drain the potatoes, stir them into the vinegar mixture and let them marinate for 30 minutes to absorb the flavors. A quick and easy, creamy potato salad. Awful. Just awful. Not one person liked this potato salad. If you like tangy potato salad, this one is for you. This is a classic potato salad. Be sure to add a little diced dill pickle for extra crunch and taste. Sprinkle paprika on top, too. Reduce the vinegar or pucker up! I would reduce by half maybe less than that.. my whole family complimented the recipe but said way too much vinegar. Excellent! Tastes just like a deviled egg potato salad. Make sure you let it chill overnight for best results. Made this all last summer and we never tired of it....great recipe!!!!!!!!!!!!!! !